The magician, in one of his more reflective moods, enters and shares a special moment from his childhood with his audience. Moments like these are rare indeed. "I took up magic at a very early age. I was poor and couldn't afford to buy a rabbit for the famous rabbit trick. So, I caught a squirrel and spray painted him white. I loved that squirrel. I named him Abra since he was iry magic animal. put him in the act--maybe he didn't like the color white. I say this because he died soon after I painted him. "When he passed away I was going to bury him but I couldn't afford to ... I still needed him in the act since I only had one squirrel. He wasn't nearly as lively being all stiff like he was. So, I just changed his name and nobody suspected anything. I changed it to 'Abra-cadaver'". On the side of each of the cases you will find a metal clip which has been covered with vinyl Ordinary people use this clip to fasten the case to their shirt pockets. Extraordinary people (magicians) can cut the case away from the clip and have the perfect device for secretly holding objects out of sight. For backpalming. the clip will hold cards out of sight beneath the coat. All that is necessary is for you to use a safety pin to attach the clip underneath the coat at the right location. You can also use the same clip in the same manner and location to hold jumbo coins until you need them for the climax to your close-up routines. You can alter the shape of the clip to hold wineglasses or just about anything which you later plan to produce. Those of you who work with jumbo coins will want the following information. You have probably tried to have your coins plated since the pewter turns colors after just a few uses. Almost everything you try to plate it with will peel off after a couple of months. Wayne Kyzer installed an answering machine toward the latter part of 1985 to handle calls for shows while he was at work. When he told me about it, he also warned me not to play any jokes on him- Until he mentioned it, the thought hadn't crossed my mind. But, since he brought it up, I figured he was really wanting some attention. The next week I had a lady who works in my office call him with the following message. "Hello. My name is Ruby Myerson with Croft's Wholesalers. My boss. Mr. Sanderson,has asked me to call you and ask you if you'll be free to perform your little magic show for our annual Christmas party on December 14. I feel so silly talking into your machine. I have $400 in the entertainment budget but I don't have any idea what a magician costs. Please return my call as soon as possible since we want to have everything finalized by this Friday. Thank you. Bye." none of which existed. I thought he would rush home for a few nights to check the machine to see if she had called, and then I would let him in on the joke. Little did I know that he would start checking all the phone and city directories for the state of South Carolina. He had Ann (his wife and professional magic proofreader) rushing home at lunch to check the machine as well as using all of her contacts to try to locate the mythical caller. There is only one person in the Columbia directory and they hounded that poor man to death. They badgered him with the fact that he had to be related to the person who made the call- Surely he knew Ruby- He just had to know her. Four hundred dollars was riding on his knowing her. The search took on a state-wide status since Wayne had performed several out of tcwn shows recently and he thought Ruby might have been one of those who asked for his business card. The FBI would do well to take a lesson from Wayne in how to locate a missing person. Being an Assistant Director Of Purchasing, he went through volumes of suppliers trying to locate Crofts Wholesalers. But I know one thing. I'll never try a stunt like that again. Before I pull another practical joke. I'll consider the consequences more thoroughly- But, maybe your friends have a better sense of humor. Maybe they would like some attention. What are you waiting for? There are no gag shops in Asheville so we had to improvise with what we could find at the local grocery, drug, and department stores. Included among the final selections were: 20 lbs. of rice, corn flakes, 5 lbs. of flour, 8 rolls of toilet paper, 3 cans of shaving cream- 5 bags of balloons, a dozen cans, two rolls of string, and one roll of masking tape. The reason I bring this up is because we found a wondrous new (to me) product which is sure to have unlimited magic uses. This great new discovery is genuine, 200 proof, fox urine. This product has an olfactory quality which cannot be described with words - clean words, anyway- While we were decorating his car with the fox urine, I was thinking of all the new vistas which were opening up to me because of this discovery- I started thinking. Which existing tricks could be improved with the addition of fox urine? What new tricks can be invented based on this magic elixer? First of all- let me enlighten you as to the procurement of this pungent product. It is not necessary to chase foxes around with specimen cups. Also, I don't know that any would sit still for a catheterization. Believe it or not, all the work is done for you and you can buy the finished product (or buy the "byproduct") in the hunting section of department stores. It seems hunters place a drop or two on the bottom of each boot and it masks the human scent. While I am sure that hundreds of uses will become obvious to you, I will describe one I am currently using in my table work at a local restaurant. Place one drop on bottom of each shoe. If you aren't going to perform the trick for several hours, you may want to marinate the soles of your shoes in a pure solution. This amount will allow you to perform the trick on staqe at the largest auditoriums (always aim for the guy in the back row). Declare that you plan to produce a fox. Everyone remaining at the dinner table will assume you are referring to a voluptuous blonde. Display a silk. Yell- "Here he is!" at the top of your lungs as you violently shake the silk. "Whoops. He's already gone. I'm sorry- He got away." Meanwhile, you tap both your feet on the floor repeatedly so that the potent aroma permeates the room. Don't be shy. Let your Gene Kelly fantasies run wild.The audience will doubt your production until the fragrance arrives. Then they will realize that the reason they didn't see the production is that they were looking for the wrong kind of fox. They will pay closer attention in the future and you will be given credit for a miracle. What more could you want? One final anecdote. I have always thought that ring auctions were inherently funny. No one should be held responsible for their actions from the moment they enter the auction. It is similar to the insanity which overcomes even the most financially conservative magicians when they enter the dealers roari for the first time. The biggest difference is that the group gathering for the auction is in search of real magic --- something for nothing. Finally- I bid $20-00- After a lot of aggravation and deep thought, Scott "decided" that $20-00 was just too rich for his blood. I now owned the prop, at least for the next few hours.Jim was surprised, to say the least — full of self-reproach to be accurate. How could an item which was overpriced at $3.00 sell for $20.00-He was dying to tell me how I had been taken, but he showed admirable restraint. (This restraint did not however. keep him from telling everyone else how badly I had been shellacked.) And I thought it was quite uncalled for when Scott came up to me after the auction and made a final offer of $35-00 (within earshot of Jim) to take the Candle Through Arm home with him. Nobody had the heart to tell Jim about the joke. They thought it would be much nicer for him to read all about it in The Trapdoor. $20-00. Creighton would really get a kick out of it and it would only cost Jim $2.00 for the joke. We received a letter the other day from a subscriber who will remain nameless citing all the things he thought were wrong with The Trapdoor. This tirade went on for several pages. So, rather than reprint the entire letter, we have decided to print just the arguments which we thought merited attention. These are listed below. We at The Trapdoor appreciate your comments and constructive critcisms and will continue to print them as we have with this individual. It feels good to be back at the helm after the "No Steve Beam Issue" and the "John Riggs Spectacular". The adage regarding the lunatics running the asylum kept popping into my mind (and I wasn't crazy about itl). This is a special "Nothing Special" issue. It's full of the same ole1 stuff-I have a lot of things I want to add to things which have appeared in these pages previously and I will use this column to do so. Regarding "Airspread" from the last issue, you might want to consult Harry Lorayne's Best Of Friends II. There are two versions of basically the same effect which are both good. John had given me his effect in March of 1985 at the Gatlinburg Convention and a few months later I bought my copy of Best Of Friends II. Since the methods are completely different, I decided to go ahead and publish John's version. Harry Blackstone- Jr. was on Country Cooking, a show which is sponsored by Wesson Oil on The Nashville Network. During the show, he pitched his book and did an all around good job on selling magic and magicians. After the introduction, he taught how to cook Steak ala Blackstone. When he placed butter in the pan to cook the meat, Florence Henderson (spokesperson for Wesson Oil and former Brady Bunch mother) asked him if he wasn't going to use the Wesson Oil- Without skipping a beat, Harry said, "Of course I'm going to use it... I use it to hold down the recipe." From Corbett Thigpen comes a great idea for coin, card, and miscellaneous clips. You may know Corbett as the auther of Hie Three Faces Of Ever a book which was later made into an Academy Award winning movie. He is also an ardent magic enthusiast with a very impressive magic collection. This is rapidly becoming one of my favorite openers for a card routine. I alternate between this and "The Color Changing Card Case" from Issue #9, page 149. I have another similar effect which will appear in these pages soon. In effect, the magician removes his wallet and removes a stack of bills from within. He takes off the top few and pockets than in disgust. "How did these ones get in here?" He displays the remaining stack of tens with pride. "A lot of people ask me if it's profitable being a magician. Well, I don't want to brag, but do you see this stack of tens? Do you know how I earned all of than?" He pauses for a response which is seldom forthcoming. "From doing card tricks!!!" As this last sentence is said, the stack of bills changes into a deck of cards. Before I describe the mechanics of this, think for a moment about the effect. It is logical, not (if you'll pardon the pun) forced. It is simple, virtually angleproof, and it leaves you with a complete, ordinary deck of cards with which to proceed. The Work. You do have to make something which will cost you from two to twenty dollars, depending on what kind of bills you want to start with. Since most of you will want to make it with ones first (to see if you like it) I will describe it with ones. I think it's funnier with fives or tens so you can use the discard gag above, but you can make it again later if you decide to use it. You will need a deck of playing cards complete with two jokers, some rubber cement, a pair of scissors or a razor blade, two reasonably new dollar bills, and about twenty minutes. Take one of the dollar bills and place it face up (George's face) on the table. Place an indifferent card on the right edge of the bill and use it to cut the right side of the bill to the shape of a playing cards. You are using an indifferent card as a pattern so that you won't mess up one of the jokers. As soon as you have the right side of the bill down to the exact size of a playing card, coat its back and the face of one of the jokers with rubber cement. Allow a few minutes for each surface to dry, and then carefully place the two glued surfaces squarely and neatly together. Use a smooth surface to rub the two together and to remove any air pockets. Throughout this make-up procedure, you are cutting money, so you want to be careful you understand the instructions thoroughly before putting blade to paper. After making the first gimmick, you are set to make the second one a little differently. Place the second dollar bill on the table face up. Take the same indifferent card you used earlier and use it as a pattern for the bill again. 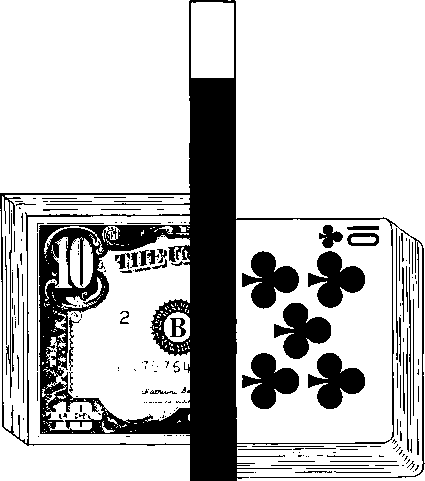 Only, this time, trim the left side of the bill so that it is the same shape as a playing card. Glue the back of the remaining joker to the back of this bill forming ginmick number two. Smooth this ginmick out as you did with the first one. Place the two ginmicks aside for now. Take the remaining deck of cards (52 since you used the jokers) and split than in the middle. Faro the two halves together and leave them telescoped. Note that all of this is preliminary work accomplished prior to the show. If you can't make a faro shuffle, just upjog every other card to give you the same results. You want the cards to overlap for about three fourths of an inch. This makes the extended pack about the same size as a stack of dollar bills. Neat, huh? Hold the near end of the tele-scoped pack in the left hand in dealing position. Place ginmick #2, dollar side up, square with the far end of the telescoped halves. Now take gimmick number one, and place it dollar side up, square with the near end of the pack. This set-up resembles a stack of dollar bills and is shown in the illustration. Holding these "bills" in dealing position, but you may want to know how to arrive there if you don't open with this trick. That is where the book type wallet comes into play. Find one that will hold this extended deck without squaring the cards together. I even took a wire clip I made from an eye glasses case (see Corbett Thigpen's ideas in Leftovers # 13, page 228) and use it to hold the cards in their extended fashion. When I remove the cards from the wallet, they are also removed from the case. A quick note on the wallet. The closest thing I could find to a wallet was a vinyl case similar to those which they use to sell tarot card tricks in. The clip is placed on the cards and the cards are placed clip-first inside the case. When I remove the cards with my right hand, I grasp the clip through the case and it remains behind. Discard the case and grasp the deck in dealing position, and you are ready for the change. 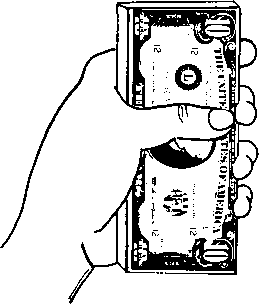 Display the stack of bills to the audience being careful to give thorn as much of a face to face angle as possible. The edges of the playing cards are lighter in color than the bills (see Regurgitations) so you don't want go give them much of a side view if you are performing this close up. You will note that your left thumb covers the place where the two bills meet so that they will appear to be one continuous bill. Also, your left first and second fingers cover the left edge where the two halves overlap. Just in case they get a side view, you don't want them to get a lecture. You are now set for the change. Turn to your left. Bring your right hand up to the edge of the near half. 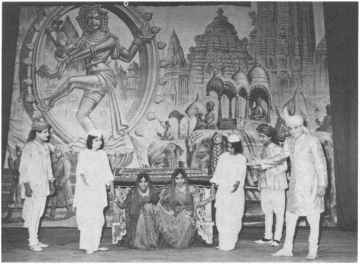 It is perpendicular to the floor and will form a shield blocking what is about to happen from the audience. Push the top card (Ginmick #1) over to the right about an inch. Here, it will be engaged by the right forefinger which will lift the right edge of the gimmick up and around the left thumb. It will reach a position where it is perpendicular to the deck and in a perfect position for the left thumb to push it into the right palm. You have, in effect, used your left thumb to secretly push the top card (ginmick) over into your right palm. As soon as the card is palmed you are going to execute the waterfall which was originally described in The False Faro, Issue # 4, page 59. Place your right thumb at the near edge of the pack and your right fingers at the far edge. You should have a good grasp on both edges. Use your left hand to push up on the center of the pack where the cards overlap. This will cause the cards to arch or bow upward. After they have reached the height of the arch, you can lower your left hand, your right hand has control over the cards. Slowly relax the pressure on the near and far edges of the pack and the cards will start to waterfall into one squared pack into the waiting left hand. All of this is covered by the right hand. It isn't crucial that you don't flash since the bills are apparently changing into cards at this point anyway. Also, the sound cards make when they waterfall forms a perfect sound for dollar bills to be making when being changed from bills to cards. When the cards have finished their waterfall, quickly square them els soon as you can and immediately execute a two-handed fan which you will display, both sides, to the audience. You will notice that the two gimmicks which are on top of the deck are now bill to bill. They form a single card (a joker) when placed together. Also, when you execute the fan, they stick together in rough smooth fashion. Close the fan. You now have several options. You may cut the deck sending the gimmicks to the middle. Then you can perform a trick which uses a snail portion of the pack. When you are ready for the clean-up, turn the pack face up. "I don't need the joker for this trick." Fan through the cards until you come to the face of the joker. Cut the pack above this card. Use your right thumb to secure a break beneath the top two cards, the two gimmicks. Upjog the two cards for about an inch. Now regrasp the joker from the front of the deck with your thumb on the face and the fingers on the back and take this card and place it in your shirt pocket. By taking it in this fashion, you display the back of the card as it is en route to the pocket. You are now clean to proceed with the rest of your routines. Regurgitations. In this effect, you have something you can use close-up or on the platform. There are a few things I should add to it. First, you should use the right deck of cards. Start with a well worn, well broken in deck. Use one that has picked up a dingy look to it. Then run it through a soozee full of fanning powder and it will fan as good as new. As a matter of fact, the fanning powder will cling better to an old deck of cards than it will to a new deck. However, the reason you want to use an old deck is so that the white borders will look less-white and will blend better with dollar bills. You might like to use some of those phony $1000 bills which were so popular with close-up magicians a few years ago. While it will probably make the whole thing less believable, it will cost you less to rig up. One bit of finesse you should add is to quickly riffle the inside edge of the bills/cards right before the change. It adds substance to the fact that you have a stack of separate bills, not just a block of wood with a bill pasted on top. Finally, both John Riggs and Phillip Young independently suggested using one of those bank bill wrappers held around the deck with a piece of wax. When you remove the bills from the wallet, the combination of the wrapper and the real bills you discard helps to take the heat off the phony stack of bills. Greg uses this for a tear-apart dove vanish. He tells the audience that he would like to introduce his new assistant, Bertha. "She's a little shy, so let's give her a round of applause to see if we can get her out here on stage." 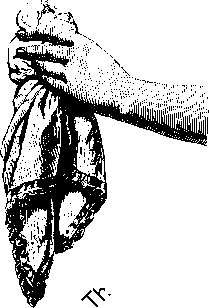 As the applause subsides, the magician removes a jug with one arm protruding from it. He then proceeds with his dove vanish. As he tears the box apart, he crashes the pieces onto the extended arm. "She" then bows and is placed back behind or inside the table. Greg started with a large plastic jug and the arm from a maniken. 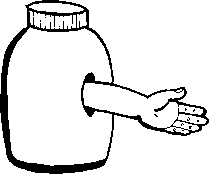 He cut a hole in the jug and anchored the arm inside the jug. Then he filled the jug with gravel to allow it to counterbalance anything which he might place on the hand. He finished by dressing up the "assistant" with some material which really added some humor to "Jug's" appearance. Regurgitations. As I said, this can be added to just about any other routine to make it funny. You can deal cards onto the hand and it will save you the trouble of getting a volunteer for trivial matters (such as the tear-apart dove vanish). Even if you have an assistant, you could come up with a humorous reason to fire her. Then introduce Bertha as her replacement. Proceed from there with the standard routine. Playing off an old expression, I'd like to mention that Bertha used to be a paper hanger (as in one-armed...). Finally, I should mention that John Riggs as already submitted to me the workshop plans for a stage-size Mr. Jimmy. I wanted the chronological record straight when I publish his version later.